Dolphins sleep with half of their brain awake and one eye open – isn’t it amazing? This article will let you know about the dolphins’ odd way of sleeping. 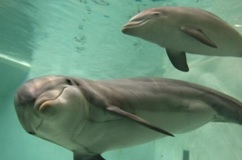 Q. Dolphins sleep with half of their brain awake and one eye open – isn’t it amazing? Ans. Yes, that’s truly amazing! While sleeping, a dolphin actually shuts down only one-half of its brain with the opposite side eye closed. This type of sleep with only one-half of the brain awake at a time is termed as unihemispheric slow-wave sleep. During that time one hemisphere of the brain is resting while the other hemisphere controls the breathing functions and monitors the activities going on in the environment and looks out for dangers if any. This type of sleep also allows the dolphin to maintain the body heat it needs to survive in the frigid ocean by carrying out certain physiological processes like muscle movement. Previous Article Which is the only mammal that can fly? Next Article Why does eating fruits make me even more hungry?